I'm linking up with Where the Wild Things Learn and Mrs. Wills' Kindergarten to share how a typical day is scheduled (you know, the way you plan for it to be, the way you want it to be, the way it needs to be in order to get through all the content, but not necessarily the way it IS), and my visual plans for the week. 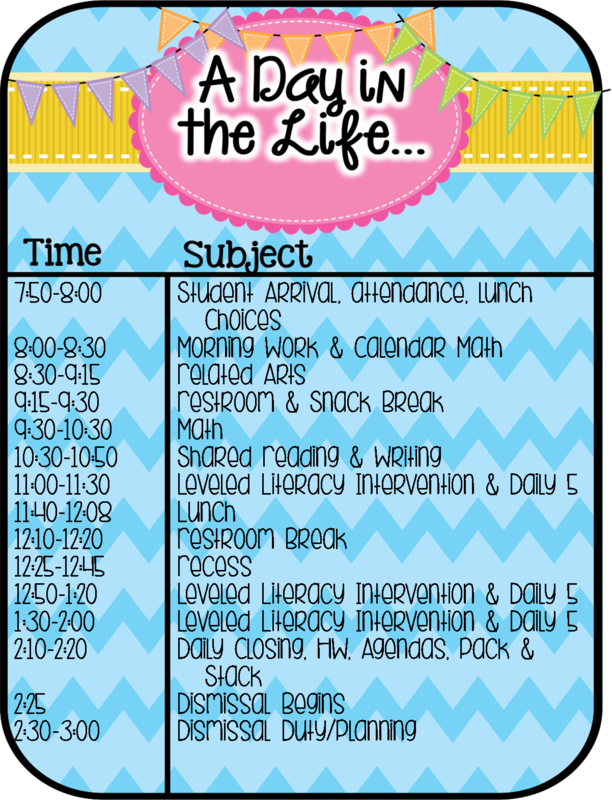 So, in an ideal world, on an ideal day, my class and I would be able to stick to this schedule perfectly. Where was that world again? Really, we do a pretty good job of staying on track. We've recently begun the Daily Five, so introducing, setting expectations for, and practicing that has been a huge focus since Christmas Break. I'm required to teach reading through LLI (Leveled Literacy Intervention), because of the special class our district has funded for low-level second grade readers. All of the science and social studies is integrated throughout LLI, so all I teach (officially) is math and language arts each day. Of course, we all teach those magical moments when students bring up an amazing opportunity for us to go off the page, off the schedule, and bring enlightenment to our kiddos. They're kind of what we live for, right? I live and teach in The South, so I go with my class to lunch, and recess, and dismissal, and I have hall duties in the mornings and afternoons. No aides for all that down here! We're used to it, but we read about those of you who have lunch "breaks" and recess "breaks", and we're a teeny bit jealous. Did someone mention unions? They're illegal here! I actually like eating with my class. It gives us all a chance to interact in a much more social way, chatting about our interests outside of school, and really getting to know each other, all while teaching a little about table manners. 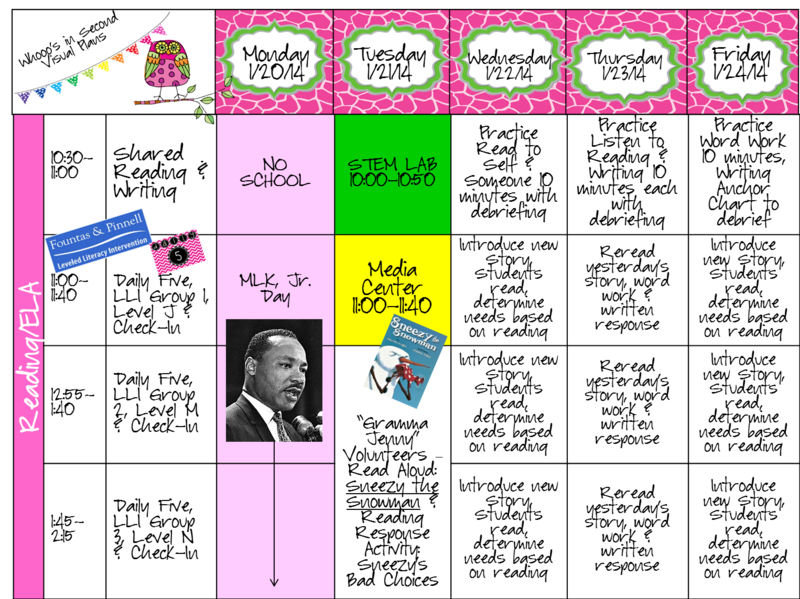 Now that you've seen the perfect day, here's a peek at my perfectly short week! In math this week, we are continuing to study 2-digit subtraction. 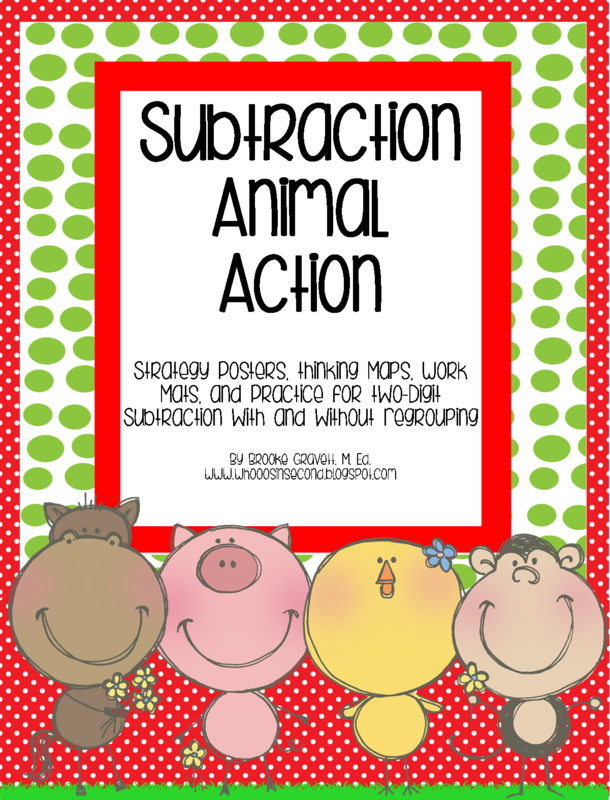 I'm backing away from the textbook for a bit to reteach the basics, using my own unit, Subtraction Animal Action. It includes every strategy I could come up with, mini-poster reminders of each, and examples and practice for each strategy, and I'm hoping it's what my kiddos need to lay a better foundation than jumping in with both feet. We tried that last week, and I ended up teaching math for TWO HOURS one day, getting through FOUR problems together, with my modeling base tens block representation on the Polyvision board, while students worked with partners, basically copying my every move and then writing the corresponding steps on paper. YIKES! Although it was long and laborious, no one seemed frustrated, so we just kept working as I thought they'd catch on to the algorithm of regrouping. They definitely understood the need, but I'm not so sure they could actually do any problems independently. You can click on the picture below to check out this unit on Teachers Pay Teachers. My mom volunteers on our crazy Tuesdays - if you look closely, you'll see that I wouldn't be able to begin to teach anything until 12:55 on Tuesdays, which certainly doesn't give me time for my three LLI Levels, much less those and math, so I decided to let S.T.E.M. be our math and my mom be our language arts. The kids love her, and just about knock her down every week when they come in from recess and see her there! This week, I fell in love with Deanna Jump's Sneezy the Snowman ideas, but needed to bump them up a little from kindergarten to second grade, so I created my own, inspired by her. I just hope the book I ordered comes in time! I also have a volunteer mom who comes on Wednesday afternoons. She's wonderful - flexible, willing to anything I need or ask, great with keeping the kids on task, showing them how to play new station games, etc. On Thursday afternoons, I have a new volunteer grandmother who's a retired teacher! She wants to help with reading, especially focusing on Accelerated Reader. I'm excited, because I have computers on again, off again, depending on whether our laptop lab is being used for MAP testing. When it is, I have no computers in my room, and have to send my students to the library to take their A/R tests. While it is workable, I have no idea what really happens while they are gone, how long they're actually in the library vs. wandering the halls, how well they attend to the test, etc. Although I'll have four laptops again beginning this week, I know the accountability factor will go up about 500% with our new A/R volunteer! She can help with login problems, make sure the kids are really reading before attempting the tests, referee the kids' "hawking" over computers, and probably even keep other students on track with their Daily Five while I meet with small groups. BONUS!!! So, there it is. A look at our day, our week, and my little dream-world of plans. 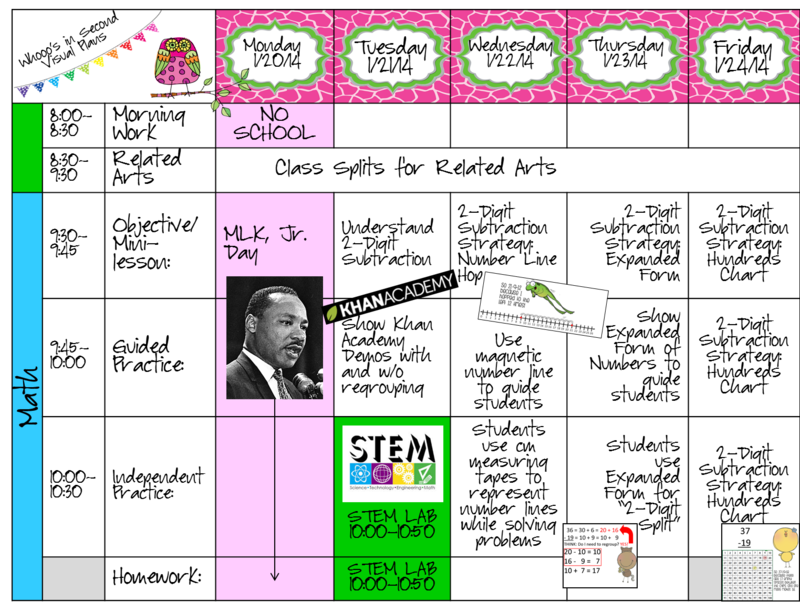 New Years Bloghop: Teachin' Like a Genius?